I love churches. Not for any religious reason, really, I’m just there for the whole production. Here you have a wonderful building, usually constructed with grand opulence, a show full of pageantry, incense, singing, dancing (in some), outfits of all designs, food and drinks, and speeches on everything from birth to death and after. It’s one hell of a show!!! Vegas has nothing on a good religious service. Now before you out there in Brightsville start in with your “oh please, there’s just as much proof that God created the universe in some sort of Christian / Muslim / Jewish / Zoroastrian / Whateverian way as there is that the Universe was sneezed out of the nose of a being called the Great Green Arkleseizure. People just need myth to feel blah blah blah”, let me tell you that I know. Really, I agree. But I am still a sucker for a good show. So if you see me sitting in the back of a church this weekend, munching popcorn with my feet up, let me go ahead and apologize. Chances are that the guy up front in the funny religious uniform and I will never see eye to eye, but at least when that collection plate comes around, I will be one of the only people in the room who drops in $10 and feels that they’ve got their moneys worth. On July 24th of 2006 I posted a blog called “Who will you cry for when they die?” and posed the question “Not counting family members, loved ones, and pets, who will you shed a tear for when they pass?” Mine was Kurt Vonnegut. Last night he died and I cried. So it goes. WASHINGTON (Reuters) - American literary idol Kurt Vonnegut, best known for such classic novels as "Slaughterhouse-Five" and "Cat's Cradle," died on Tuesday night in Manhattan at age 84, The New York Times reported on Wednesday. 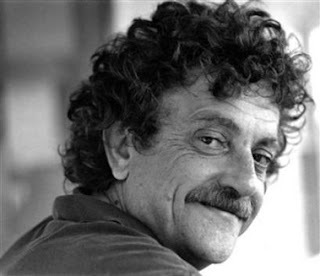 Longtime family friend, Morgan Entrekin, who reported Vonnegut's death, said the writer had suffered brain injuries as a result of a fall several weeks ago, the newspaper reported. Vonnegut, born in Indianapolis in 1922, also wrote plays, essays and short fiction. But his novels -- 14 in all -- became classics of the American counterculture. He was a literary idol, particularly to students in the 1960s and 1970s, the Times said. The defining moment of Vonnegut's life was the firebombing of Dresden, Germany by Allied Forces in 1945, an event he witnessed as a young prisoner of war, the newspaper said. Dresden was the basis for "Slaughterhouse-Five," which was published in 1969 against the backdrop of war in Vietnam, racial unrest and cultural and social upheaval, the Times said. Vonnegut became a cult hero when the novel reached No. 1 on best-seller lists, the article said, adding that some schools and libraries have banned the book because of its sexual content, rough language and depictions of violence. The novel featured a signature Vonnegut phrase, "so it goes," which became a catch phrase for opponents of the Vietnam war. After the book was published, Vonnegut went into severe depression and vowed never to write another novel. In 1984, he tried to take his life with sleeping pills and alcohol, the report said. Vonnegut's books were a mixture of fiction and autobiography, prone to one-sentence paragraphs, exclamation points and italics, the report said. Some critics said he had invented a new literary type and other accused him of repeating himself, of recycling themes and characters. Some readers found his work incoherent, the Times said. "Cat's Cradle" was published in 1963 and although it initially sold only about 500 copies it is widely read today in high school English classes, the newspaper said. Vonnegut's last book, published in 2005, was a collection of biographical essays, "A Man Without a Country." It, too, was a best seller, the newspaper said. His first play, "Happy Birthday, Wanda June," opened Off Broadway in 1970 to mixed reviews and around the same time he separated from his first wife, Jane, the Times said. Vonnegut, a fourth-generation German-American, is survived by his wife photographer Jill Krementz, their daughter and his six other children, the New York Times said.